WARNING: Because etanercept works by blocking the immune system, it may lower your ability to fight infections. This may make you more likely to get a serious (rarely fatal) infection (such as fungal infections, bacterial infections including tuberculosis) or make any infection you have worse. Tell your doctor your medical history, especially of past/recent/current infections. Also, tell your doctor if you have lived or traveled in areas where certain fungal infections (such as coccidioidomycosis, histoplasmosis) are common or if you have been near someone with tuberculosis. Areas where these types of fungal infections are commonly found include the Ohio and Mississippi River valleys and the southwestern United States. You should be tested for tuberculosis (TB skin test or chest X-ray) before and during treatment with etanercept. See Side Effects section for symptoms of infections to watch out for, and get medical help right away if you develop any of these symptoms. The immune system is also important in preventing and controlling cancer. Though it is very unlikely to happen, there is a risk (especially in children/teens/young adults) of developing cancer (such as lymphoma, skin) due to this medication or due to your medical condition. Discuss the risks and benefits of treatment with your doctor. Tell your doctor right away if you develop symptoms such as unusual lumps/growths, swollen or painful abdomen, unexplained weight loss, persistent fever or night sweats. USES: This medication is used alone or in combination with an immunosuppressant (such as methotrexate) to treat certain types of arthritis (such as rheumatoid, psoriatic, juvenile idiopathic, and ankylosing spondylitis), as well as a skin condition called psoriasis. These conditions are caused by an overactive immune system (autoimmune disease). The immune system attacks the body's own healthy cells, causing inflammation in the joints and skin. Etanercept controls your body's defensive response by blocking the action of a certain natural substance (TNF) that is used by the immune system. Treatment decreases redness, itching and scaly patches in psoriasis as well as the pain, swelling and stiffness of joints in arthritis. This medication can stop the progression of disease and joint damage, resulting in improved daily functioning and quality of life. This medication treats but does not cure autoimmune diseases. Symptoms usually return within 1 month of stopping the medication. HOW TO USE: Read the Medication Guide and the Patient Information Leaflet provided by your pharmacist before you start using this drug and each time you get a refill. If you have any questions, consult your doctor or pharmacist. 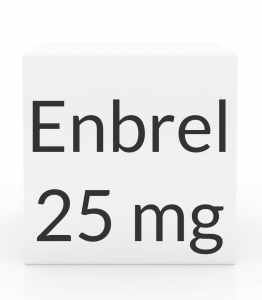 Etanercept is injected under the skin of the thigh, abdomen, or upper arm, usually once or twice weekly exactly as prescribed by your doctor. Your dosage is based on your medical condition and response to treatment. Do not change your dose without first consulting your doctor. Use this medication regularly in order to get the most benefit from it. You should start to see an improvement in 1 to 2 weeks. It may take up to 3 months to receive the full benefit of this medication. If you will be giving yourself the injection, your doctor may want you to have the first injection in the medical office. Make sure you learn the proper way to inject this medication from your health care professional, as described in the Patient Information Leaflet from the manufacturer. Remove the medication from the refrigerator and allow it to warm to room temperature before injecting. This takes about 15 to 30 minutes. Do not shake the product. Before using, check this product visually for particles or discoloration. If either is present, do not use the liquid. Before injecting each dose, clean the injection site with rubbing alcohol. It is important to change the location of the injection site each time you use this drug to prevent problems under the skin. New injections should be given at least 1 inch (2.5 centimeters) from an old injection site. Do not inject into areas of the skin that are sore, bruised, red, or hard. Learn how to store and discard needles and medical supplies safely. Consult your pharmacist. Never reuse needles or syringes. Tell your doctor if your condition persists or worsens. SIDE EFFECTS: See also Warning section. Redness, itching, pain, or swelling at the injection site may occur. This usually starts 1-2 days after the injection and clears up in 3-5 days. Injection site reactions usually lessen after the first month. Headache may also occur. If any of these effects persist or worsen, tell your doctor or pharmacist promptly. Remember that your doctor has prescribed this medication because he or she has judged that the benefit to you is greater than the risk of side effects. Many people using this medication do not have serious side effects. Tell your doctor right away if you develop signs of infection while using this drug, such as: fever, chills, persistent sore throat, persistent cough, night sweats, trouble breathing, painful/frequent urination, unusual vaginal discharge, white patches in the mouth (oral thrush). Tell your doctor right away if you have any serious side effects, including: a rash on nose and cheeks (butterfly rash), dizziness, extreme fatigue, looking pale, hair loss, swelling of the arms/legs, unusual bruising/bleeding, severe headache, mental/mood changes, seizures, unexplained muscle weakness, numbness/tingling of the hands/feet, unsteadiness, vision changes, severe stomach/abdominal pain, persistent nausea/vomiting, dark urine, yellowing eyes/skin. An allergic reaction to this drug is unlikely, but get medical help right away if it occurs. Symptoms of an allergic reaction include: rash, itching/swelling (especially of the face/tongue/throat), dizziness, trouble breathing. This is not a complete list of possible side effects. If you notice other effects not listed above, contact your doctor or pharmacist. In the US - Call your doctor for medical advice about side effects. You may report side effects to FDA at 1-800-FDA-1088. In Canada - Call your doctor for medical advice about side effects. You may report side effects to Health Canada at 1-866-234-2345. PRECAUTIONS: Before using etanercept, tell your doctor or pharmacist if you are allergic to it; or to latex or natural dry rubber (found in the prefilled syringes or autoinjectors); or if you have any other allergies. This product may contain inactive ingredients, which can cause allergic reactions or other problems. Talk to your pharmacist for more details. Before using this medication, tell your doctor or pharmacist your medical history, especially of: active or recurrent infection (such as hepatitis B, HIV, tuberculosis), blood disorders (such as leukemia, anemia), weakened bone marrow, history of cancer (such as lymphoma), diabetes, heart failure, seizures, nervous system problems (such as multiple sclerosis), a certain liver problem (alcoholic hepatitis), blood vessel disorders (such as vasculitis). Do not have immunizations/vaccinations without the consent of your doctor, and avoid contact with people who have recently received oral polio vaccine. Consult your doctor about risks of exposure to chickenpox and other infections. Before having surgery, tell your doctor or dentist about all the products you use (including prescription drugs, nonprescription drugs, and herbal products). Caution is advised when using this drug in the elderly because they may be more prone to infections. It is recommended that children be up to date on all their childhood vaccinations before starting etanercept. During pregnancy, this medication should be used only when clearly needed. Discuss the risks and benefits with your doctor. It is unknown if this drug passes into breast milk and the effect on a nursing infant is unknown. Consult your doctor before breast-feeding. DRUG INTERACTIONS: Drug interactions may change how your medications work or increase your risk for serious side effects. This document does not contain all possible drug interactions. Keep a list of all the products you use (including prescription/nonprescription drugs and herbal products) and share it with your doctor and pharmacist. Do not start, stop, or change the dosage of any medicines without your doctor's approval. Some products that may interact with this drug include: abatacept, interleukin-1 blockers (such as anakinra, canakinumab, rilonacept), live vaccines (such as measles, mumps, polio, rubella, typhoid, varicella, yellow fever), other medications for autoimmune disease (such as azathioprine, cyclophosphamide, tofacitinib). OVERDOSE: If overdose is suspected, contact a poison control center or emergency room immediately. US residents can call their local poison control center at 1-800-222-1222. Canada residents can call a provincial poison control center. NOTES: Do not share this medication with others. Laboratory and/or medical tests (such as complete blood count, liver function, TB test) should be performed periodically to monitor your progress or check for side effects. Consult your doctor for more details. This medication may interfere with certain lab tests. Be sure to tell the lab personnel that you are on this medication. STORAGE: Store unopened vials and prefilled syringes in a refrigerator between 36-46 degrees F (2-8 degrees C) away from light and moisture. Do not freeze. Once mixed, this drug must be used within 14 days and should be stored in the original vial in the refrigerator. Keep all medications away from children and pets. Do not flush medications down the toilet or pour them into a drain unless instructed to do so. Properly discard this product when it is expired or no longer needed. Consult your pharmacist or local waste disposal company.